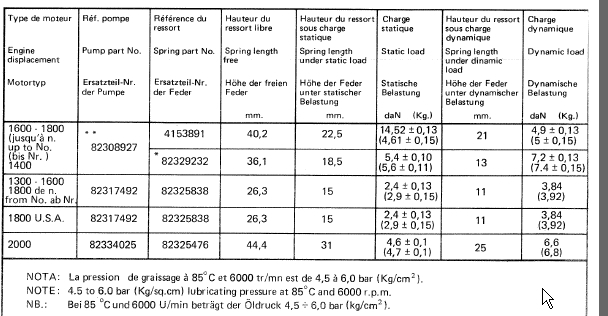 Do you know if the oil pressure sender unit (82387178) has a scale of pressure of 0-6 bar or 0-8 bar? Thank you so much for your support.. I don't know if this is any help but have just checked two spare sender units in my "store " and both have the same stampings on the base. They are 2G 73 03 0 - 8 a bit of a problem with the dash before the 8 it has a dot above and below the line as in ""division" (Can't do it on my keyboard ) Hope I haven't confused you even more. Ammy thank you for your reply! an oil pressure sender with a scale of 0 to 8 bar, will transmit a lower pressure to the gauge on the dashboard.. The Lancia Thema 8V too, seems to be a oil sender of 0-6 bar..